“Hi, I’m Pete” said the man in the seat behind me on the bus tour of the World War II Battle Sites of Guam. Pete McCraren was an experienced tour participant and quite a significant historian of military battles despite his rather young age of 35 or so. Pete had been going from the inception in Los Angeles where the tour group would embark to Japan and then to Guam before going on to Iwo Jima. Some of the tour group were actual participants in the battles of Guam and Iwo Jima and had returned with their families to visit these notable battle sites where Marines and the Japanese had fought in 1944 and 1945. We would see the large memorial service on Iwo Jima with hundreds of participants from Japan and the United States including bands. We climbed Mt Suribachi and stood at the exact spot where Marines had raised the flag in the early days of the battle of Iwo Jima. My entire life I had never met anyone who had known anything about my father in combat, nor did I expect to after such a long period of time had passed. 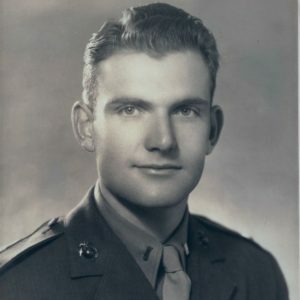 Many of the Marines that fought in the Pacific were wounded or killed, and age had moved forward for them, and I never had expected any information about my father to be available. “Well that would be nice if there actual was anything about him,” I responded, hardly thinking that information about him would really exist. The telegram that had notified my grandparents of my father being KIA in Guam and a following letter about him leading a group of Marines during an attack through some hills had successfully stopped the Japanese group on that hill was all of the information we had known. I opened an email about 10 days after our trip from Pete, and there it was, the information on the books about my father and scanned pages from some of them. I was stunned that this story had existed, and had I not met Pete on the tour, I probably would never have known it. The first person mentioned in the first book was my father. NEAR the end of May, 1944, we left Guadalcanal for good. We were the artillery regiment of the division, so we rode to the beach. The artillery always seemed to have lots of vehicles for moving guns, ammunition, and communications equipment. This morning the regiment’s trucks were drawn up in the mud around our camp, and we felt lucky that we wouldn’t have to slog several miles to the beach through the mud and the rain like the infantry. Our commanding officer, a tall first Lieutenant from Westwood Village, CA stood next to one of the trucks and made a speech. The men stood in the drizzle beneath their packs and helmets and listened soberly. The Lieutenant was a serious young man. His name was Rodgers, and he had been a football player at UCLA. He was going to be killed in this coming operation. So were a lot of Marines listening to him. When the Lieutenant was through talking, we said goodbye to the fellows staying behind and piled into the trucks. A little before noon a line of landing boats hurtled onto the beach, and Lieutenant Rodgers called the outfit into column. “First time north of the Equator in twenty-three months,” a private exclaimed. We would stretch a poncho on the hard deck, under one of the landing boats if we could find room, and gaze at the sky and try to locate the North Star. It was important to us that were again in the hemisphere where we could see the North Star, after having been for so long beneath the Southern Cross. This confirmation of the rumor that we might be going to Guam excited many of the men. Guam would be the first inhabited American possession that we would retake from the Japs. It had been seized by the Japanese in their first rush southward in December 1941, after Pearl Harbor. Our small detachment of Marines and sailors stationed there had not had a chance. With the exception of one man, they had all either been killed or taken prisoner. It seemed as if we were streaking through the water now, trying to get to the Marianas as fast as we could. My job, about which I had been thinking for a long time, was going to be to make an eyewitness recording of the landing operation and the fighting on shore which would be sent back for radio stations in the United States to broadcast. If my unit was caught in any tight spot, I should naturally have to fight with it. I should always be obliged to defend myself and take care of my own safety. If Lieutenant Rodgers ever needed me, I was trained to be able to fill in and be useful. During the night of July 25th it rained. At first there were just sporadic shots – a rifle or a carbine shot into the night. Then they came oftener. The woods on top of the hills above us were resounding with shots. There were hand-grenade blasts and sudden bursts of BARs and machine guns. Soon the word spread; the Japs had broken through. Several thousand of the enemy were behind our front lines, threatening all of our rear units. Lieutenant Rodgers, with whom we had sailed to Guam, collected a squad of men and boldly led it after the Japs. For A.H. Rogers and Robert Wolfe, the events that took place during the Banzai that morning on Guam will forever be etched in a remote corner of their minds. Together, they told us what happened. “We were receiving sniper fire from the hillside on our immediate right flank. “There was a narrow trail leading down toward our bivouac area, and we were moving slowly, maybe four feet apart. The Lieutenant was in the lead, then Corporal John Wyly, A. H., myself, and Harry Bailey was bringing up the rear. Just as Lt Rodgers and Wyly came to a bend in the trail, they jumped back and started shooting. They had come head-on with a sizeable number of Japanese. When the shooting began to end, the Marines in the camp below us started firing up the hill. The Japs were trapped between. “Wolfe was pretty well spent after carrying Wyly the way he did, so he stayed there with the Corpsman tending to John while I went back to our Command Post to report what had happened. I was born in October of that year. On July 26th, 1968, exactly 24 years later, I was with the very same Marine Corps unit that my father was with when he was killed, the 12th Marines of the 3rd Marine Division. I was sitting on sand bags on top of our bunker looking into North Vietnam from our Marine Corps base on the DMZ, thinking of how proud I was of him on that day in Guam, and hopefully how proud of me he was having the privilege to lead Marines in combat also. On this Memorial Day, and every Memorial Day, we remember the hundreds of thousands of service men and women who sacrificed everything to allow us to have what we have today. That blood of heroes never dies”.